Ward and I celebrated our 30th wedding anniversary on Thursday. He made arrangements for us to have dinner at Tabor Hill- a bountiful vineyard with a very good restaurant about a half hour north of South Bend in Michigan. It was a charming place and we ate in an area overlooking a panoramic view of their vineyards. We passed up the wine tasting area, but each of us enjoyed a glass of their great wine with our meal. Such a special event, and such a kind and wonderful man! Am I or am I not an extremely lucky broad? Yes. Studio Update: I've been busy ordering supplies and organizing our little gallery after the busy summer. And Randy, our computer guru, has recently installed "Snow Leopard", Mac's latest operating system. I kept putting that off, and I'm relieved to have it up and running. There have been a few hectic moments and Randy has come to the rescue. I don't want to brag about any of this because I don't want to tempt fate! 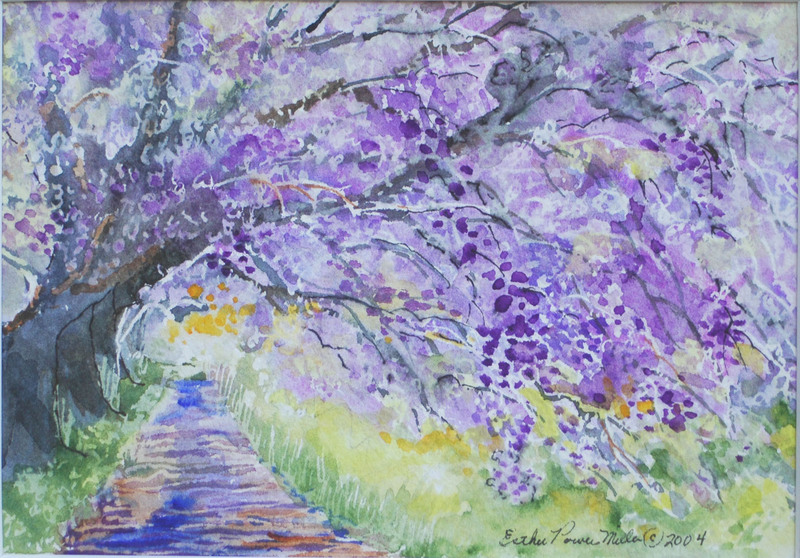 The purple tree image is from one of our larger note cards. This was so refreshing to paint , and I hope to work more in this very impressionistic style. It's usually fun to try something quite different. I'll be interested in your reaction to this "unlike Esther" approach to watercolor. Will be back with another blog very soon. And visit www.maxinkuckee.com for exceptionally good Culver info. Next weekend is Labor Day when the primary special Culver event will be the third annual Lake Maxinkuckee Film Festival. Painter and Poet Gallery is open on Fridays and Saturdays from 10 to 5, and on Sundays by chance. We will be open over this coming Labor Day weekend. At other times, check for our OPEN sign, or call ahead for an appointment - 574-842-8888. It's good to be back blogging. Our summer has been busy in our gallery. Ward and I have been working hard to try to keep up on orders for our collectors, knowing that we will have plenty of time after Labor Day to work on new paintings and poetry. Uncle John's Barn is featured today. 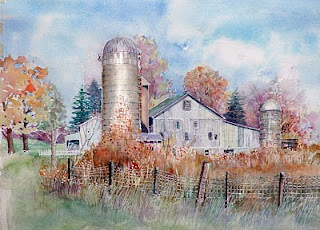 Inspired by an old barn located on a country road several miles west of Plymouth (and about 10 miles from our home), this interesting barn with two silos fascinated me, and this scene tumbled around in my mind for a long time before I tackled this painting. The fence, flowers and weeds are from my imagination. I've named this painting for my father, whose first name was John. 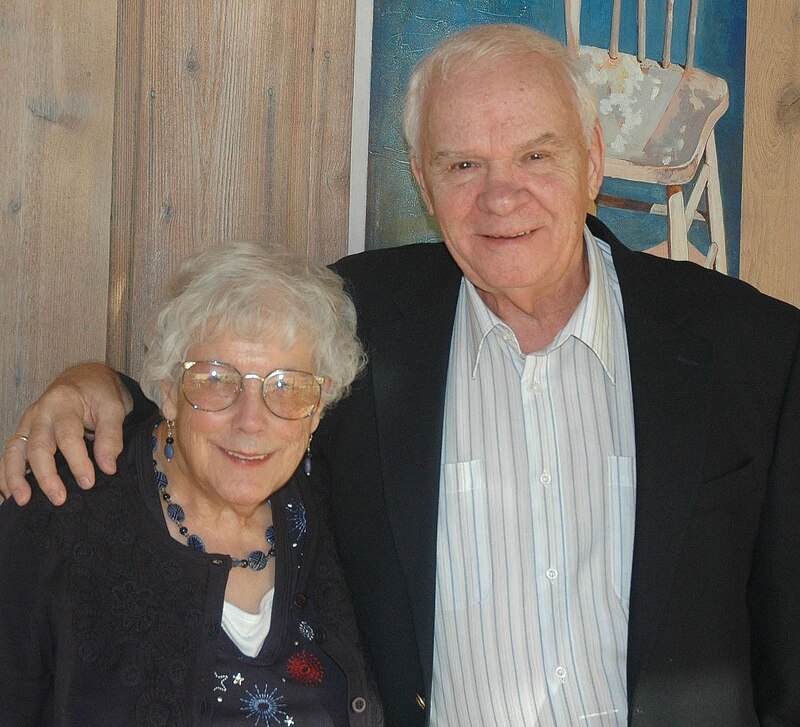 He was beloved by almost everybody who knew him, and adored by me. I grew up on a farm and spent many happy hours with my father. Last year, I was invited to submit 2 paintings for inclusion in an upcoming book, a continuation of "Hoosier Painters of the 21st Century" by Mark Butterfield of Greenfield, Indiana. 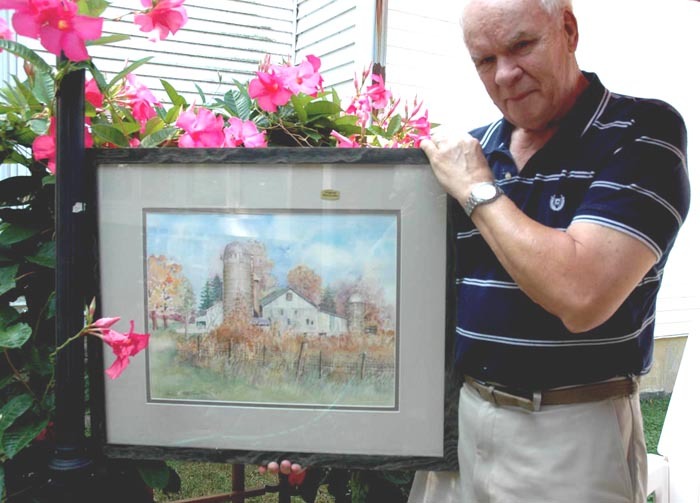 Images of this painting and "Culver's Train Depot" are planned for inclusion in this book. (We have prints of the Depot for sale on our web site). Book details unclear since Mark is having difficulty getting his book printed because several printers that he has used before, have gone out of business. The purchaser of this painting will be given a free volume of this book (by me) if and when it is published. This transparent watercolor, "Uncle John's Barn", is about 18" x 14". Overall size including the archival matting and frame is about 28" by 24". The top mat is a neutral sandy color (between light tan and gray) with a medium brown mat beneath it. Framing is a simple contemporary rustic style - very versatile. The colors will appear different on different monitors, and the picture of Ward holding this painting is included to give you a better idea of the size. Price of this custom framed painting is $1450.00 plus shipping costs. Offered for sale until September 12, 2010 to the first qualified buyer. Cash, money order, PayPal or other credit cards. Call me at 574-842-8888 to place your order and for an estimate of shipping costs. If you buy this without actually seeing it and are not satisfied, we will refund your purchase price. Studio Update: I'm progressing slowly, but 'getting there" on the large very challenging painting I've been trying to finish, and am at the stage where I always get nervous - about 85% done. I want to be sure it has just the right amount of detail but not too much. Lots of standing back and then trying out small areas on scrap paper before adding to the BIG one. I sure don't want to spoil it now. After it's delivered, I'll post it, so you'll see what I've been up to. For relaxation, I'm been sneaking away to work on another 6" x 6" blog painting. Subject matter of this is a corner of our house with our flag flying. Working on this one is pure pleasure. Will post it soon in another blog. Stay cool! And in another 3 or 4 months, we'll be saying - "Stay warm". Never satisfied, but here in the midwest, we do enjoy variety !